Son of Severianus and Theodora, known for their piety. Elder brother of Saint Isidore of Seville, Saint Fulgentius of Ecija, and Saint Florentina of Cartagena. Monk at Seville, Spain. Bishop of Seville. Converted Saint Hermengild and Prince Reccared, sons of the Arian Visigoth king Leovigild, who then exiled Leander to Constantinople from 579 to 582. 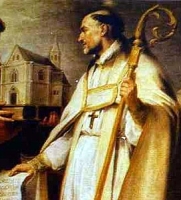 There he became close friends with the papal legate who later became Pope Saint Gregory the Great; he recommended that Gregory write his famous commentary (Moralia) on the Book of Job. When Reccared ascended the throne, Leander was allowed to return to Seville. He worked against Arianism, and presided over the Third Council of Toledo in 589. He revised and unified the Spanish liturgy, and his boundless energy and steady faith led the Visigoths back to orthodox Christianity. Leander wrote an influential Rule for nuns. He introduced the Nicene Creed to Mass in the west. Honored as a Doctor of the Faith by the Church in Spain. Born to the nobility, she grew up in a family of wealthy land-owners. Joined of the Soeurs de la Charité de Notre-Dame d'Evron (Sisters of Charity of Our Lady of Evron), dedicated to education of children and care of the sick. She began teaching at the parish school of St-Pierre-des-Landes in 1783. Martyred in the French Revolution for refusing to take the oaths of allegience to the state, and helping to hide priests who had also refused. Sister Francesca sang the Salve Regina as she climbed the scaffold to the guillotine. A Christian priest in Moorish Spain, Roderick had a brother who became Moslem and another with no religion. One day he tried to break up a fight between his brothers; they turned on him and beat him into a coma. The Moslem brother, seeking further revenge, announced to authorities that Roderick had converted to Islam. When Roderick awoke, he was questioned about it, and denied the allegation, claiming allegiance to Christ. The Moslem authorities took this to be apostasy, deciding Roderick was denying his new Moslem faith. He was imprisoned for several months, and then martyred with Saint Salomon of Cordoba. Born to the Italian nobility. Received into the Franciscans by Saint Francis himself. Deacon. Custos of Saint-Denis, the first Franciscan friary in Paris, France. Worked with the University of Paris. Appointed by Saint Francis to introduce the Franciscans into England in 1224. With eight associates he established houses in Canterbury and London, then a school for friars in Oxford. Friend of King Henry III. Helped prevent civil war between Henry and Earl Marshall. Known for his personal piety and his strict adherence to the Franciscan Rule, especially on the matter of poverty. Priest. Hermit at Castel Raimondo near Torcello, Italy. Bishop of Camerino, Italy, consecrated by Pope Leo IV; he accepted the vocation on the condition that his parishioners did not have to recruit soldiers, an obligation imposed on most bishops of the time. Confessor to Emperor Louis the Pious. Attended the Council of Rome called by Pope Saint Nicholas I in 861. Miracle worker. His association with crops come from his work of feeding the poor. Once when the granary was empty, but there were still poor people to feed, he prayed for help; the granary was found to be full, and everyone ate their fill. Born wealthy, he spent his fortune on charity, then made a pilgrimage to Rome, Italy as a mendicant. Benedictine monk at the Abbey Saints Peter and Andrew at Novalese in the Alps in 726, a community with many former pilgrims. 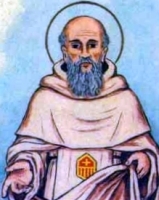 Abbot of the house for 30 years during which he greatly expanded the library and built a hospice for the safety of travellers on Mount Cenis. Benedictine monk at Santissima Trinita monastery, Cava dei Tirreni, Salerno, Campania, Italy under the leadership of Blessed Benincasa. Abbot of the house in 1195. Obtained the support of Emperor Henry VI for the house. Involved in the region's politics of the day. Founded the hospice of Vietri sul mare in 1202. Monk at Lindisfarne, England. Friend of Saint Colman of Lindesfarne. Monk at Innisboffin, Ireland in 668. Abbot at Mayo of the Saxons abbey in 670, a house for English monks in Ireland; he there served until 697 when he resigned in favour of Saint Adamnan. Saw the supplanting of the Celtic rite with the Roman rite in his abbey. Founded the abbey of Elytheria in Connaught, Ireland; of Teaghna-Saxon; and a convent led by his sister Segretia. May have been bishop of Mayo, Ireland, but records vary. Nephew of Saint Ita, who raised him. Monk at Bangor Abbey in Ireland under Saint Comgall of Bangor. Founder and abbot of Liath-Mochoemoc monastery. Sister of Saint Bernward of Hildesheim. All traces of her history were destroyed by Protestants. Married of Saint Macedonius of Nicomedia and mother of Saint Modesta of Nicomedia. The whole family was martyred with several other Christians whose names have not come down to us. Unmarried lay woman arrested, tortured and martyred for her faith in the persecutions of Diocletian. Monk and then prior of the Saint Claudius Abbey in Léon, Spain. He and all his brother monks were martyred by Arian Visigoths. 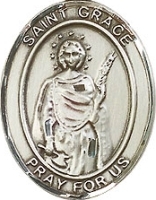 Married to Saint Patricia of Nicomedia; father of Saint Modesta of Nicomedia. The whole family was martyred with several other Christians whose names have not come down to us. Daughter of Saint Patricia of Nicomedia and Saint Macedonius of Nicomedia. The whole family was martyred with several other Christians whose names have not come down to us. 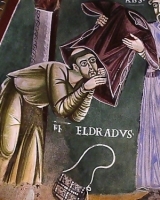 Mercedarian monk. Abbot of the convent of Santa Maria in Avignon, France. Christian member of the imperial household of Roman emperor Diocletian in Nicomedia (in modern Turkey). Martyred for his faith. Father of Saint Horres of Nicaea. Martyred with his son and several other Christians. Son of Saint Theusitas of Nicaea. Martyred with his father and several others. Bishop of Poitiers, France. Helped Saint Radegunde to found her convent. Martyred in the persecutions of Khosrau I of Persia. Seventh century saint honored in Kyle, Scotland; I have found no other reliable information.